We are a leading Wholesale Distributor of folding thermometer, one-hand temperature measuring instrument, core temperature thermometer, temperature measuring instrument, 1-channel temperature measuring instrument and temperature measuring instrument (1-channel) from Pune, India. The testo 104 is the first ever waterproof folding thermometer! Its protection class IP65 allows the instrument to be cleaned under running water, and use under any conditions. The instrument has a robust metal joint and a very rigid, long temperature probe. The surface is covered with non-slip rubber, guaranteeing especially comfortable, safe handling and measurement. With the help of coloured strips, the instrument can be easily allocated and personalized. 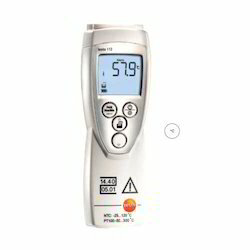 The folding thermometer testo 104 is conform to HACCP and EN 13485. Its narrow measurement tip leaves only small punctures in the foodstuffs, making it ideal for spot check measurements – for example in production, storage and processing, in gastronomy, in supermarket chains, in food retail or in industry. 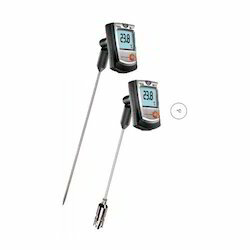 The testo 105 is a robust food thermometer with exchangeable measurement tips for temperature measurement on semi-solid media. It has an additional measurement tip for frozen goods. Depending on the probe used, it is particularly suited to applications in the areas of gastronomy, refrigerated rooms, large kitchens, supermarkets and the checking of Incoming Goods. Since it can be cleaned under running water according to IP65, it is especially hygienic, and applicable everywhere, thanks to its robustness. An audible and an optical alarm reliably warn when individually adjustable upper and lower limit values are violated. 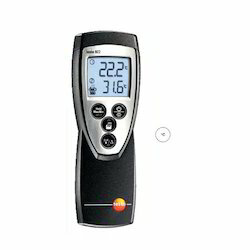 The core thermometer testo 106 is especially fast and robust. Its small handy shape means it is always close to hand and ready for use. Thanks to its very thin and robust measurement tip, it is excellently suited to core temperature checks in gastronomy, hotels, large kitchens, supermarkets etc. The dishwasher-safe TopSafe protects the instrument from dirt, water and impact. The testo 106 is comform to HACCP as well as EN 13485. If required, upper and lower limit values can be stored in the instrument; as soon as these values are violated, audible and optical warning signals are given. This alarm function and the automatic final value recognition facilitate measurement and support you in recognizing and interpreting measurement values quickly and correctly. 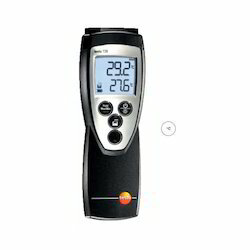 The thermometers from the product series testo 108 carry out spot check measurements in seconds. Whether in the transportation and storage of foodstuffs, in restaurants, in large kitchens or in chain restaurants. The testo 108 is insensitive to moisture and water, and thanks to the softcase (protective cover), is safe from impact damage and dirt. 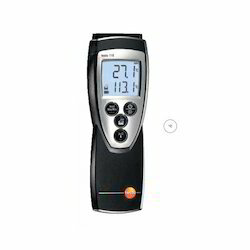 The testo 110 is a highly accurate, universally applicable temperature measuring instrument. The optional protective cover (TopSafe) protects it reliably from dirt, water and impact; this makes it ideal for use in tough surroundings. With the TopSafe, the testo 110 conforms to HACCP as well as EN 13485. The monitoring measuring instrument is especially designed for measurements in refrigerated rooms and buildings, and in outdoor areas. In addition to the wide selection of classical probes, a wireless radio probe can simultaneously be used (when the wireless module in used in the instrument). As the user, you can set your own upper and lower limit values in the instrument; as soon as these values are violated, an audible alarm sounds. In addition to this, the minimum and maximum values are clearly shown in the 2-line backlit display. The officially calibratable temperature measuring instrument testo 112 was specially designed for official monitoring measurements. Thanks to the PTB type permit and the possibility of official calibration, the instrument is authorized for use in official measurements by food inspectors, assessors and authorities. An integrated self-test provides security even before the measurement. Thanks to the broad measurement range, the testo 112 is the ideal temperature measuring instrument for all aspects of food inspection. NTC probes (thermistor probes) as well as Pt100 probes (platinum resistance probes) can be connected to the probe input, covering a broad measuring range from deep-frozen goods to checks on deep-fryers. Occurring minimum and maximum values can be conveniently called up in the two-line display, and when individually adjustable upper and lower limit values are violated, the measuring instrument immediately provides an audible alarm. In order to document the temperature values, the testo 112 offers the possibility of printing out the data directly on site incl. date and time using the Testo report printer. 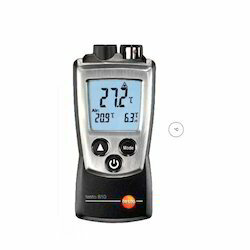 The testo 720 is a robust temperature measuring instrument for precise air, surface and immersion measurements in the measuring range from -100 to 800 °C. It is possible to connect Pt100 probes as well as NTC probes to the onechannel measuring instrument. In combination with the TopSafe, the testo 720 is resistant to aggressive media – as is the glass-coated probe, which has proven its worth in daily laboratory work. You, as the user, can store limit values in the instrument yourself; as soon as these upper or lower limits are violated, an audible alarm sounds. The instrument also continuously shows all minimum and maximum values in its large backlit display. Using the optional Testo report printer, the measurement results can be directly printed out on site as required. The robust and compact measuring instrument testo 735 is universally applicable and is available in two versions: testo 735-1: Precise temperature measuring instrument without measurement value store testo 735-2: Precise temperature measuring instrument with measurement value store (10,000 values) PC software and USB data transfer cable The instrument has a probe input for highly accurate Pt100 probes and two inputs for fast thermocouple probes. The measurement values from up to three further temperature probes can be shown in the clear measuring instrument display wirelessly, i. e. using measurement data transfer by radio. A system accuracy of 0.05 °C at a resolution of 0.001 °C is achieved using the highly accurate plug-in Pt100 immersion/penetration probe. The measurement system is thus ideal for use as a working standard. Selectable user profiles, i.e. programming of the buttons adapted to the application, enable intuitive and fast operation. The infrared thermometer, measuring only 80 mm, fits in any jacket pocket, and is always ready to hand for fast measurements. 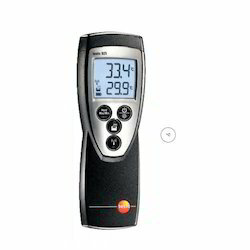 The testo 805 is used, for example, for measurements in Incoming Goods and in temperature checks in supermarket shelves. It is also optimally suited to fast measurements in the food sector and in facility technology. The testo 805, with the TopSafe (optional), is waterproof and protected from impact and dirt according to IP 65. 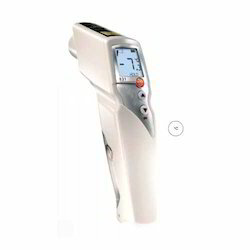 It has a scan mode for long-term measurement, and a Holdfunction for freezing the measurement values. In addition to this, minimum and maximum values are reliably displayed. The testo 830 is a universally applicable infrared thermometer for non-contact measurement of surface temperatures in trade and industry. Thanks to a new processor, and therefore better resolution, even more precise measurements are now possible. Temperature can now be recorded to an accuracy of 0.1 °C. Thanks to the min./max. function, the limit values of the last measurement can be displayed and even better monitored. The testo 830 infrared thermometer in brief: testo 830-T1 with 1-point laser measurement spot marking and 10:1 optics. testo 830-T2 with 2-point laser measurement spot marking and 12:1 optics. testo 830-T4 with 2-point laser measurement spot marking and 30:1 optics. This instrument measures the surface temperature even of smaller objects at a safe distance. External temperature probes can be connected. 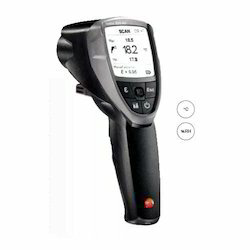 The testo 831 is an infrared thermometer for distance measurement. Thanks to its 30:1 optics, the measurement point diameter is only 3.6 cm at a distance of 1 m. This allows smaller objects such as yoghurt pots to be conveniently measured at a distance. Thanks to a 2-point laser marker, the diameter of the measurement point is displayed exactly, avoiding measurement errors. At two measurements per second, the testo 831 is so fast that scans of palettes or refrigerated shelving can be carried out. 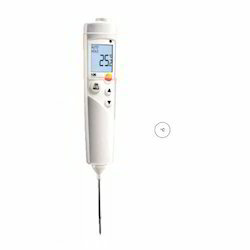 Set testo 831 and testo 106 For certain temperature measurements in the food sector, it is necessary to carry out an additional core temperature measurement. 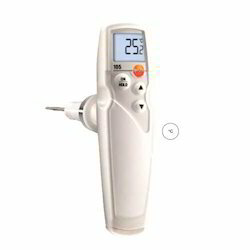 For this purpose, Testo offers an economic set consisting of the testo 831 and the proven core thermometer testo 106. Take advantage of the benefits the testo 835 series has to offer, in virtually all sectors of trade and industry: e.g. monitoring wall temperature and humidity, inspecting air conditioning and ventilation systems, the maintenance of industrial systems or the quality control of industrially manufactured products.Testo infrared measuring technology, which delivers firstclass results even at long distance, is particularly helpful when monitoring the temperature of objects that are small, moving, difficult to access or extremely hot. The many features increase the room for manoeuvre, for example in the building trade when carrying out surface moisture measurement via infrared, or in the metal, glass and ceramics industry when measuring temperatures up to 1500 °C. So you can be certain of having everything under control and of safeguarding your standards of quality at all times. 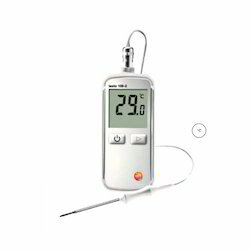 The testo 905-T1 is a particularly fast penetration thermometer with a broad measuring range of -50 to 350 °C, in the short term even up to 500 °C (1 to 2 minutes). The measuring instrument has a professional industrial sensor (thermocouple Type K). It has an excellent level of accuracy, especially in the upper measuring range. 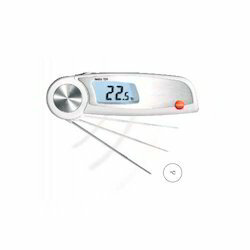 The testo 905-T2 is a surface thermometer with a broad measuring range of -50 to 350 °C, in the short term even up to 500 °C (1 to 2 minutes). The sprung, broad thermocouple measurement head guarantees a very fast reaction time and high accuracy thanks to the ability to adapt to rough surfaces. Both instruments have a rotatable display with whose help the measurement values can be read off optimally from different perspectives. 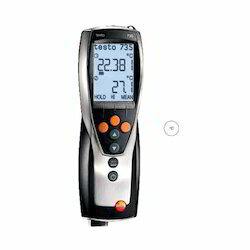 Testo 922 is a temperature measuring instrument which is especially suited to applications in the HVAC field. 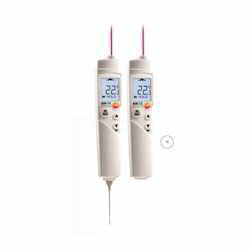 The measuring instrument records the temperature values of two connected thermocouple probes, and shows these simultaneously together with the differential temperature in the display. Measurement data transfer by radio additionally allows the measurement value from a further temperature probe to be displayed wirelessly. With the TopSafe, and the probe plugged in, the measuring instrument has protection class IP65. The instrument continuously displays the minimum and maximum values. The measurement values shown in the display (current measurement value, fixed measurement value or the minimum/maximum value) can be printed out on site using the Testo report printer (optional). In addiition to this, the measurement values can be cyclically printed – the intervals can be individually set. The testo 925 is a 1-channel temperature measuring instrument which is particularly suitable for applications in the HVAC field. 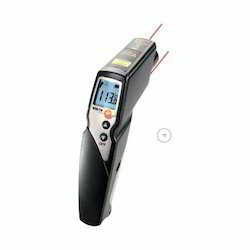 The instrument is optimum for the connection of fast and reliable thermocouple probes. Using measurement data transfer by radio, the measurement value of a further temperature probe can be additionally displayed wirelessly. The protective cover TopSafe ensures water- and dirt-proofness when a probe is connected. The instrument reliably and continuously displays the minimum and maximum measurement values. The measurement values shown in the display (current measurement value, frozen measurement value, or the minimum/maximum values) can be printed out via the Testo report printer (optional). The user can store limit values in the instrument himself; as soon as these upper and lower values are violated, an audible signal sounds. The testo 810 is a handy temperature measuring instrument which measures air temperature, and simultaneously surface temperature by infrared. For example, the temperature of a radiator, an air outlet or a window can be easily and conveniently compared to the air temperature in the room. 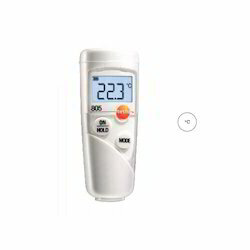 The difference between air and surface temperature is automatically displayed. Thanks to its handy design, the testo 810 is quickly to hand and easy to stow, for example in a trouser pocket. The infrared measurement is carried out with a 1-point laser measurement spot marking and 6:1 optics. The emissivity can be individually set depending on the application, and with the help of the min./max. function, the minimum and maximum values are shown in the display. HACCP from every point of view: the testo 826 series has just been optimized. A higher resolution thanks to the new processor ensures even more accurate measurement results. This allows the temperature to be recorded to an accuracy of 0.1 °C. The min./max. display shows the limit values of the last measurement. You can measure and monitor the temperature of the goods reliably and safely. • Always monitor, measure and document temperature accurately, cleanly and quickly. • Fulfil HACCP regulations, and be able to provide proof at any time. • Maintain the cold chain in storage and transport. • Reduce the quantities of spoiled goods and use resources efficiently. • Measuring instruments calibrated according to strict regulations. • Conform to HACCP as well as EN 13485. Looking for Testo Thermal Imagers ?